Happy Thanksgiving. I adore this holiday, especially for the reminder to count my blessings. It’s that time of year. The gratitude days. Today, I am feeling particularly grateful for this space, and all of you who come to visit me here. I am grateful for my kooky dog who leaps into my lap at the most surprising moments. I am grateful for lazy mornings and apple fritters with Dennis. Gratitude extends to good novels (The Goldfinch. Read it. No kidding) and afternoons spent knitting, watching movies on Netflix. I am breathing again. Remembering what I do when not facing a massive list of obligations. For the first year in ages, we’ll have Thanksgiving elsewhere and will forego our annual Dead Poultry Society party. It didn’t seem like a good year to add more stress to my adrenaline fueled life. I’m happy to be making this stuffing and a couple of pies (this one and this one) for tomorrow’s dinner. I like the idea of being a guest. It’s cookie and candy time around here. I do this every year, and, frankly, I over-do it every year. The list of cookies is crazy long and there will be some busy days and nights, but each sweet is like an old friend, and the stirring, kneading, decorating and packaging is a meditation for me, releasing memories with each step. The contest closes next Monday, December 2. I’ll use the Random Number Generator to select a winner, and your cookies will arrive a few days later. Until then, you’ll find me in the kitchen in a cloud of sugar, butter, vanilla and flour. Cathy, you’re a total inspiration! Happy Thanksgiving to you and Dennis! There are 6 cookies on my list for this year (pecan shortbread ganache bite size sandwiches are my favorite) and I thought that was a lot! The box is simply beautiful! My trees are heavy with Meyer lemons, so maybe the peel should be a new addition. As always, thank you for sharing your recipes! OMG…I am envious of your ambition! My favorite: what could be better than a rugelach with a good cup of coffee. Maybe two rugelach…OK three. You are truly a culinary over-achiever, Cathy. I just made my 4th batch of dulce de membrillo. And I plan to make Laura Silverman’s chocolate-chile caramels. Oh, how I wish I would win! It all sounds so delicious. I need to make those gumdrops. For the record, I like you on Facebook and follow you on Twitter. (And I’ll send you something back, if that will help the rafflecopter pick me!) Anyhoot, right now I’m thinking of making some caramels only because you suggested it. I’ve never been able to pull it off before. I figure if I follow a recipe from Laura I might just get it this time. Happy Hanukkah, Happy Thanksgiving, and most of all, happy to count you as a friend. You inspire on a routine basis to be a more creative cook. The gratitude days…that will stay with me. Glad to hear you have a little breathing space. It’s been quite the year for you! I usually only enter giveaways when it’s something really good. Those cookies look REALLY good. Happy Holidays! I always look forward to yummy peanut butter blossoms. Thanks for such a great giveaway. Happy Holidays, everyone. Italian Rainbow cookies. I already do the FB and twitter thing. I love holiday cookies, but rarely make them. I enjoy making pies. Happy Thanksgiving! I love homemade caramels — though everything you listed above sounds delicious. I might have to make a few batches of cookies, too! Yum, love making candy (my salt caramels are great) and cookies. Happy Thanksgivukkah! These look beautiful. I love following you on FB (don’t do twitter) and the kids and I enjoy making chocolate peppermint bark together. I dont really have a favorite Holiday treat anymore. Once I had the gastric bypass surgery my love affair with food went right out the door, along with the marriage to my fork. But there is this thing called regifting that us federal employees can certainly utilize this year… And since I am gifting the fruits of my canning obsession this year…it sounds like a match made in my kitchen!! It’s such a great time of the year for people who have something. These days there are so many people who have so litttle or nothing. It’s a good time to try to help out as much as you can. I love the italian cookies that a real italian bakery (one of the last) makes only at this time of the year. Happy Holidays! Not entering because I’m not on Facebook (plus I’m in Canada), but thanks for the recipes – I’ll have to try making candy this year. Cathy – when do you sleep? As usual, I am so impressed with all of your projects. Favorite treat? Those Little Apricot Confections. I made them once – years ago – and had totally forgotten about them. Thanks for jogging my memory. Pies are gorgeous! Enjoy the bounty! Thanks for the inspirations! Oops my favorite treat is impossible to determine.! This is the first time in 52 yrs that I have not had to fix a big Thanksgiving dinner. We are going to my nieces for dinner. Your pies look delicious. Have a great day. Congratulations, Bernice! You’ve won the cookie box. Please get in touch so I can get your address. Email me at mrswheelbarrow AT gmail DOT com. Happy Thanksgiveing. I love pecan sandies. I love, love, love them. Happy Thanksgiving to you and your family! My favorite cookie for the holiday is Pfeffernüsse. Have a bountiful holiday! 1. My favorite cookie is the one you make for me. 2. 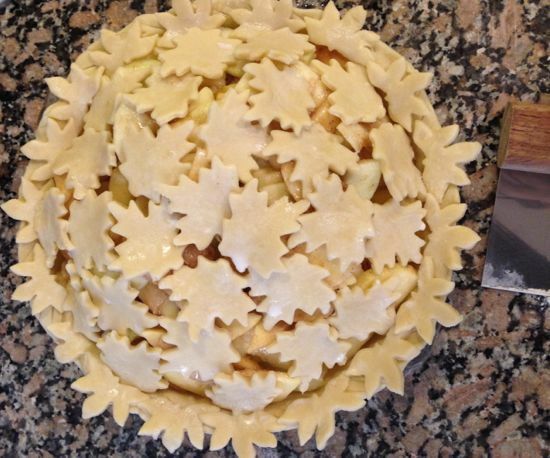 I also make a leaf-covered pie, but I love your leaf cutter more than mine! Where can I get one? My favorite cookie is the finished product of any cookie recipe started. Each and everyone is an act of love. I don’t buy gifts, I buy ingredients, make my gifts for everyone and share the heaping dose of love that is included in every bite. My favorite holiday cookies are these little almond cookies my mom made every year. They are divine and I can’t make them or I will eat about 50 in one setting; thereby, setting the stage for a massive New Years resolution. Homemade mincemeat and peppermint stick ice cream. Happy Hanukkah, Merry Christmas, and I’ll add a wish for a nice visit from Sinterklaas on 5 Dec as well. Best from The Hague! Must do more baking this season myself! Just getting ready to jump back into the world myself…….Nova Scotia shortbreads made to look like chocolate dipped strawberries and canadian tourtiere are my favorites. I’m afraid I don’t facebook or twitter but, be assured I “like” you. My favorite holiday treats are fancy chocolates. They’re the one thing I buy for myself. Sometimes after hours of baking, I love having a cup of tea and a treat that I didn’t prepare myself. What an inspired assortment! What discipline to have them all around you! Thank you for year round deliciousness..
Kathy, I love your blog and your cookies look amazing! You are an inspiration, especially here in D.C.! I love chocolate chip meringue cookies. Blessings for the season. Pick me! Pick me! I know it’s random, but I’m sending winning vibes out 🙂 Honestly Cathy — and this is going to sound like teacher’s pet, but I looked forward to your awesome gift of holiday goodies every year. I always thought I’d savor them over the week, but by the end of the day they’d be gone. I never shared them with anyone and I never felt a bit guilty for that! I’m excited that you’ve posted recipes for all my faves and I plan on adding quite a few of yours to what I make this year. Thanks! My mouth is watering! Peppermint patties and fig newtons??? I guess my favorite holiday cookie is one from my childhood. One of the many holiday cookies my mother made (and I still make) are the Ginger Creams from the Betty Crocker cookbook. Homemade caramels are our favorite! Melt in your mouth & wrap up nice for gift-giving! 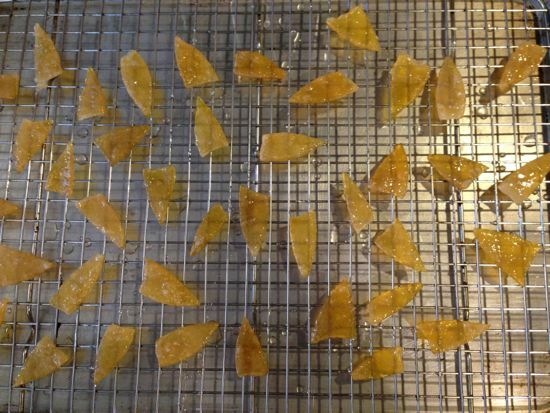 My favorite holiday treat has got to be toffee and I resolve to learn to make it this year. A delicious crunchy crumbly layer of toffee covered with good chocolate and chopped nuts … Yum. I used to make truffles with a group of ladies, one who used to own some fancy chocolate store in Colorado. Each year she would make the truffle base and the ladies would all decorate with nuts, nonpareils, cocoa, etc., but she’s never share the recipe. I have the recipe……and will share for for a share! I love so many – but I think my favorite to make and stash and eat (and sometimes share) is the fairy food sponge candy – coated in a combination of semi sweet and milk chocolate. My favorite treat is holiday cookies! I don’t know if this would count, but I LOVE to make homemade eggnog every holiday season!!! I consider it a huge treat, that I wait all year to make! I also absolutely adore holiday cookies who doesn’t really, so festive, cheery and tasty. Thanks! Favorite: the (overly) frosted cookies I make with my daughter. Happy Thanksgiving! I love to bake cookies for Christmas too. A few favorites here are peanut butter blossoms, chocolate gingerbread, and chocolate crinkles. My favorite treat is the chess pies that my mother made. There is absolutely no nutritional value and way too much sugar, but they are sooo good. My favorite holiday treat — my great Aunt Emilie’s Russian Tea Cakes. I can never make them as small and perfect as she did. 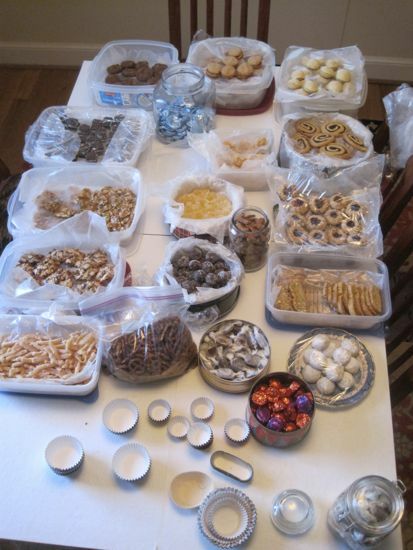 One of my favorite Christmas memories was helping my Grandma make divinity. She would let me put the cherry, raisin or black walnut on top. Divinity is still one of my favorites, as was Grandma . I love jam thumb print cookies and lemon gum drops. Your kitchen must be full of beautiful aromas…. Honestly, Cathy, our NEW fave treat is your Cran/Ras/Pecan Conserve from the NYTimes last year! Just made a new batch and am busy giving it away… Our OLD fave is mom’s Land O’Lakes Nutmeg Butterfinger cookies. She really got into nutmegs one year and even wrote a small nutmeg cookbook as xmas giveaway! A chance to have your cookies! Wouldn’t miss that! my favorite holiday treats are these amazing toffee-cookie bars that my mom makes every year. i need to get the recipe from her! I have the chili caramel recipe on my list to try, Happy Thanksgiving! I’ve loved getting your post and your Facebook entries. I covet your confections! Every year I bake at least ten different types of sweets, but this year I won’t be able to. i’ve had abdominal surgery and I can’t roll out dough, bend down to get into my cabinets or lift my mixer! Sigh. My absolute favorite holiday treats are the made-from-scratch gingerbread houses that have become a family tradition. I had enough time before surgery to roll out, cut and freeze all of the individual pieces. We’re all looking forward to filling the house with the smell of clove, ginger and cinnamon! Everything you make is dreamy-good! Your holiday treats are the sugar plums dancing in my dreams. Already sending FB and twitter (and IRL) love to you. I wish I had that energy! I am hoping to get the motivation to make linzer cookies and gingerbread. Already a fan on facebook and twitter. Beautiful cookies! My favorite holiday treat is my mom’s chocolate covered toffee. I haven’t made it in a few years… this year I will. How wonderful that you are enjoying the holiday season and able to take a few deep breaths. I am hosting a gingerbread party this weekend and hope to be channeling your talents as I bake this week. And caramels…I must find the time to make the caramels! I love homemade almond roca and peanut brittle my mom and I make every year. The holiday starts when I eat the first pieces. I adore a good shortbread or butter cookie! I liked you awhile back on FB and love reading your posts and your recipes. 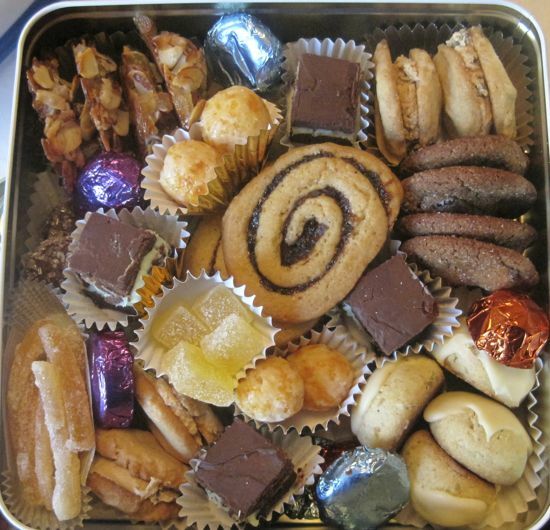 Your cookie box assortment is beautiful! My Christmas favorites are anise drop cookies and rosemary/cranberry biscotti (great dipped in a glass of red wine). I like to make my mother’s cottage cheese tarts–bow-ties made with cottage cheese and filled with either apricot, cherry or poppyseed filling. What a gorgeous array of cookies! I’m drooling. My favorite Christmas cookies at the moment are pistachio and cranberry biscotti, chocolate espresso cookies, and Italian honey cookies (an old family recipe from my great-grandmother). In addition, this year I plan to make panettone and homemade marshmallows. Cathy, What a delicious smorgasbord of cookies! The Rugelach reminded me of the days sitting on Grandma’s counter, learning her secrets. Not to mention getting to participate and eat the ending results! A favorite confection she made, and I continue to make, is Peanut Butter Candy Balls. Different from the traditional Buckeye candies you see everywhere, they have more than just powdered sugar and P.B. Who doesn’t like chocolate and peanut butter?!! cardamom-vanilla caramels sound amazing! I’m a gingerbread cookie girl, myself, when it comes to holiday baking. my favorite is sugar cookies! I would have to say that my favorite holiday treats are a tie between giant ginger cookies (from better home and garden), holiday chocolate delights (from eating well) and easy Italian cookies (also from bhg). I won’t have time to do much baking this year though, as we have a serious illness in the family. Your cookies look amazing! Just tried the link for the Cardamom Vanilla Caramels and it goes to the Choc-Chili recipe. I don’t see any link from there….am I missing how to get there? What a gorgeous pie! My favorite holiday treat is panettone.